The new feature bridges the physical experience gap between software and hardware, allowing users intuitive control along with the ability to quickly create and modify Omnisphere sounds by using the familiar layout of their supported hardware synth with minimal setup. 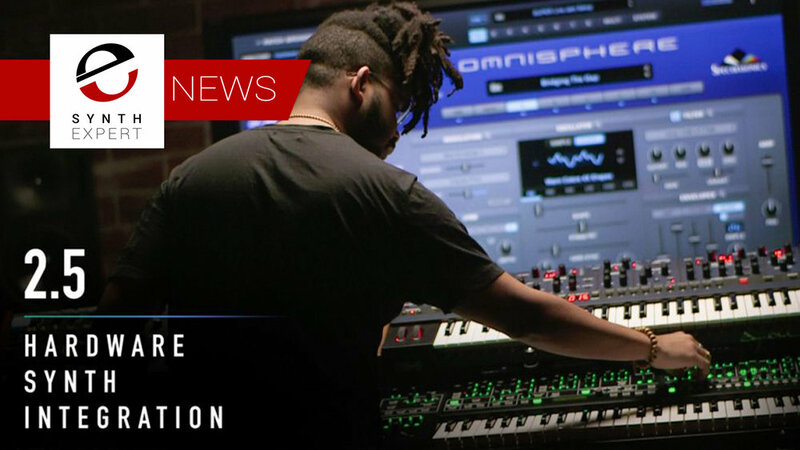 The initial release will officially support over 20 hardware synths that include Moog, Dave Smith Instruments, Roland, Korg, Behringer, Novation, and Sequential, with Spectrasonics saying there are more to come. Spectrasonics say that the new Hardware Synth Integration feature in Omnisphere v2.5 goes far beyond the typical “MIDI Learn” approaches that many software synths employ. The Spectrasonics’ team has designed unique “Hardware Profiles” for each supported hardware synth, making the unique features of that hardware work seamlessly with Omnisphere, translating MIDI messages from the hardware into satisfying sonic results in Omnisphere. This new system allows Spectrasonics to enable sophisticated interactions from a single touch of a knob, including the ability for Omnisphere to automatically recall entire FX racks, assign multiple scaled parameters and even instantly create complex modulation matrix routings on-the-fly. The new development system also allows Spectrasonics to add new profiles for new hardware synths in the future. With workflow in mind, it’s easy for musicians to use – they can use the synth of choice just by selecting the hardware synth from the drop-down HW menu. Omnisphere 2.5 dramatically expands the synthesis capabilities of Omnisphere by doubling Omnisphere’s voice architecture to Four Layers per patch. Each patch can now utilise up to 12 envelopes, 8 LFOs and the Modulation Matrix has been increased to 48 modulation routings. Newly-designed State Variable Filters are included, which were specially created for the OB-6 hardware profile and can seamlessly blend between low-pass, notch and high-pass filter modes. Over 50 new “Analog” Oscillator Wavetables are included and featured in the new hardware profiles. Omnisphere 2.5 includes a new “Hardware Library” with hundreds of new patches created by Eric Persing and the renowned Spectrasonics Sound Development team using the Hardware Synth Integration feature. Each hardware profile has a corresponding set of sounds in the Hardware Library which were specially designed utilizing that hardware synth as an Omnisphere controller. The new sounds feature a wide range of categories and many have a distinctly ‘classic analogue’ flavour. The new sounds are available for all users, regardless of whether they use hardware or not. * A complete list of new features and supported synths will be announced upon the official release in mid-Summer 2018. The Omnisphere 2.5 update will initially be released in May 2018 as a Public Beta. All registered Omnisphere 2 users with Standard licenses are eligible to join the Public Beta test. Spectrasonics encourages end users to participate and provide feedback in the Public Beta test. The company says that users who give high-quality testing/feedback reports in the Public Beta will be eligible to join the official Spectrasonics Beta Team for future products. Spectrasonics Omnisphere 2.5 is a free update to all registered Omnisphere 2 users. Public Beta starts later this month, with an official release in mid-summer 2018.